I never made it to Ken's Ramen when it was in the 88 Food Court in Allston, but I was not going to miss my chance again, given that is only three blocks away from the convention center. I led a group of six, intrepidly through the sleet, to arrive 10 minutes before the 6pm opening. There was already a group in line before ahead of us. My friend Lon questioned why we were there so early and I assured him that if we were not there before opening, we would have to wait longer for a table. Sure enough, five minutes after we are seated I told him to turn around and look at the packed restaurant and the people milling about outside in the cold. The restaurant is tiny; The tables are really meant for four people, but we managed to squeeze in six. The menu is small, but no matter I was there only for one thing – the Ramen. 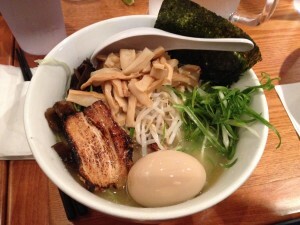 The signature dish is the Paitan ramen ($10); the base is a whole chicken broth is simmered for over 30 hours. I paired it with the wavy, thick, yellow noodles, and topped it with wood ear mushrooms, scallions, seaweed, bamboo shoots, cha-siu (Chinese roast pork) and a soft boiled egg. It was delicious - The broth was rich with deep Unami flavor and the noodles were a perfect combination both toothsome and springy. The only letdown was the cha-siu - it was lean and a little chewy. Yumewokatare's pork belly is far superior. The rest of my group seem to enjoy their various noodle selections - for a period of time there was no conversation, just the sound of the six of us slurping our noodles up against the den of the restaurant noise. I appreciated that they had a gluten-free option for Ivanie (a bowl of rice, instead of noodles). The walk back to the convention center seemed less frigid then the way over with a belly full of heart warming soup in it.